Cabinet installation accounts for approximately 40% of kitchen remodeling, according to Angie’s List. However, did you know that cabinets can be installed in more than just your kitchen? Rooms that benefit from more storage include kitchens, bathrooms, and home offices. To get the most out of your living space, you’ll want to call your local cabinet makers. They’ll be able to help you come up with storage solutions that work for your home and lifestyle. Are your bathroom countertops cluttered? You may want to ask us about installing bathroom wall cabinets. Not only do wall cabinets free up counter space, but they also give you a place to discretely store bathroom items. For example, you may not want your guests to see an entire package of toilet paper sitting on the floor. Storage options in bathrooms are usually limited to shallow medicine cabinets and small sink cabinets. Thankfully, you can choose custom cabinets that complement your home and lifestyle. For example, we can make bathroom cabinets to fit all your towels, shampoo bottles, and more. Do you work from home? If so, you may want to consider using wall cabinets to store office supplies. Unlike bookshelves or filing cabinets, wall cabinets free up floor space. That way, you’ll have plenty of floor space to collaborate with colleagues or hold meetings. Built-in cabinets suggest permanence, which is exactly what you want when trying to impress new clients. How your home office looks can say a lot about how you run your business. A home office that is neat and organized will leave a good impression on prospective clients so you can continue growing your business. A messy office, on the other hand, could leave the impression that you’re unorganized and unprepared. Custom cabinets give you enough storage space so you can make the right first impression. Interested in installing kitchen cabinets? Many of the homeowners we work with decide to install new kitchen storage cabinets to free up much-needed counter space. Kitchen cabinet makers offer custom storage options for your home and lifestyle. For example, if you have a busy household, you may want a pantry cabinet to store canned goods and other kitchen overflow items. It’s important that your cabinets complement your overall kitchen design. 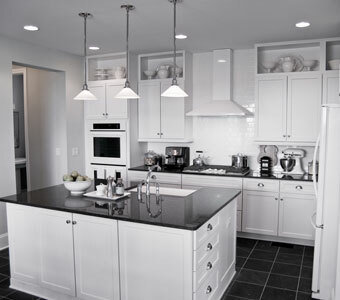 For example, white kitchen cabinets can help a small room feel spacious and airy. Black kitchen cabinets, on the other hand, help a large room feel cozier. Cabinet companies offer both light and dark woods for you to choose from. Have questions about cabinet installation? You’ve come to the right place. We’ve been helping homeowners just like you since 1981. We offer both cabinet design and installation so you can create the best storage for your home. Our Portage cabinet makers are able to create and install cabinets for kitchens, bathrooms, and even home offices. We are proud to serve Portage, Kalamazoo, Battle Creek, and surrounding areas. To schedule an estimate for cabinet installation, call Abode Building Center at (269) 329-1800.